A new online crime map has revealed a street in Portsmouth had one of the highest amounts of violent crimes in England and Wales in December. Thirty-eight offences were reported in Guildhall Square, while Glovers Court in Preston was highest with 44. The www.police.uk website allows the public to search for crime and anti-social behaviour reported last month for their street or postcode. Hampshire Police said they had targeted the area over the past few years. The new crime map also revealed Surrey Street in Portsmouth saw a total of 136 crimes reported last month, with Glovers Court in Preston was top with 152. Councillor Eleanor Scott, member for community safety at Portsmouth City Council, questioned the figures for the small street which is only home to a "respectable pub". She said: "It's a tiny street, there's a few flats, a car park and a nice respectable pub where the postal workers from the nearby postal depot stop for a drink. "If Portsmouth is anything to go by, this website is a complete farce, it's identifying wrong crime epicentres." 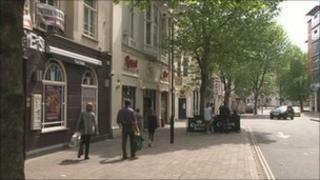 Police said the postcode of Surrey Street was used to record incidents of retail crime such as shoplifting from the adjacent commercial centre and violent crime from the bars and clubs of nearby Guildhall Walk. On Guildhall Walk, leader of the council Gerald Vernon-Jackson added: "It's an area which is just filled with bars where the owners make their money by getting people drunk and chucking them on to the streets for the police to deal with. "New licensing laws should give the city council powers to make sure these bars then have to pay for the policing for the area." Assistant Chief Constable Laura Nicholson, from Hampshire Police, said: "What we have done in last few years around Guildhall Walk... we have local neighbourhood teams, an outstanding licensing team... but we do need to work more with the retail business to make it safer. "But we are happy to be held accountable and want people to tell us what the problems are so we can continue to try and reduce incidents."